See sunrise and sunset everywhere! The terminator is the name of the dividing line between night and day on a celestial body. 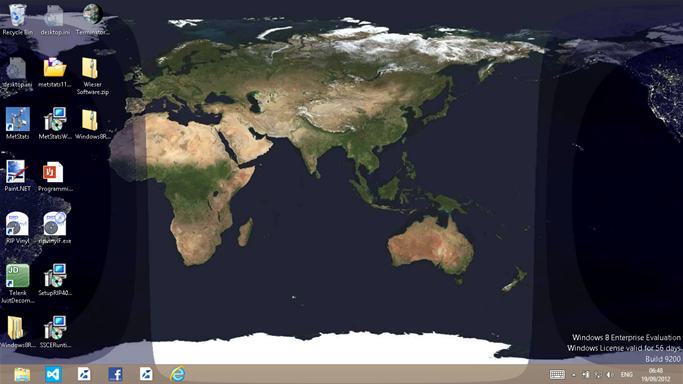 Now you can see it as it moves around the earth as your screen's background. You can choose to have the program automatically launch when you log into windows, and update the background, or you can just run it in its own window. However you prefer, we think you'll agree it's a very nice relaxing background to look at. The image is updated every 60 seconds, after which time the program goes back to sleep. We don't notice any performance impact on our systems while it is running. When you launch the program, a small icon shows up in the system notification area on your taskbar. You can either left click the icon to open the program, or right click to get a menu, which allows you several other options including exit and about. 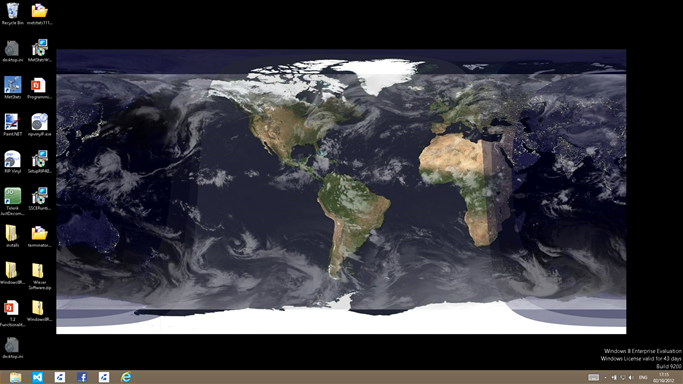 Now you can see the cloud cover overlaid onto the image as well if you choose. The cloud cover image updates once a day, so while it isn't terribly accurate, it does mean you'll never see the same desktop backdrop twice, and it does look pretty.